HCH improved materials to enhance performance. The materials from which the bearing components are made determine to a large extent the performance and reliability of rolling bearings. HCH knows very well of bulk conveyors’ working environment that fatigue phenomenon will occur to the bearing material after a duration of operation. To delay the advent of material fatigue and prevent shock loads damage, HCH takes special care of its raw material used in bearings. HCH's new heat treatment system helps the bearing material to reach the characteristics of high level of hardness, high rolling contact fatigue resistance, excellent wear resistance, dimensional stability and excellent mechanical strength which are essential to delay the advent of material fatigue. HCH bearings’ optimized seal structure and clearance, customized grease reduce the cost of the maintenance. HCH knows that the slow speed makes difficult between rolling elements and raceways. In addition, the rolling bearings in continuous transferring processes are continuously exposed to extremely heavy loads. We have a variety of appropriate and high quality greases to prevent bearings’ metal-to-metal contact. What is more, our optimized seal structure prevents the bearings from the threat of cooling water entering into the bearing cavity, which can dilute the lubricant and corrode the bearing. For this application, please also consult our engineers for clearance selection to avoid unnecessary creep. 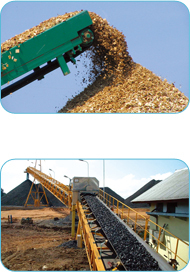 HCH knows that the bulk conveyor industry expects high reliable products, also increased productivity and cost-effectiveness.The challenge is to be able to monitor performance and identify potential problems at an early stage. Thus, to understand the nature of problem is critical.